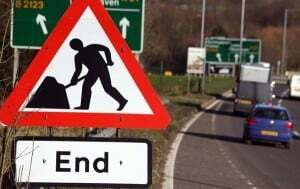 More than 450 miles of major roadworks are to be lifted across England in the run-up to this year's four-day Easter break, Highways England has announced. A total of 97 per cent of the nation's roads will be free from roadworks by 06:00 GMT on Thursday, March 24th. This means the millions of motorists who are planning journeys during the coming Easter bank holiday weekend will benefit from fewer disruptions when out and about, although motorists are reminded that traffic volumes will still be higher than normal on many routes and this could lead to delays. Highways England director of customer operations Mel Clarke commented: "We've worked closely with other transport providers to ensure our network can cope with increased demand, and we're pleased to say that 97.2 per cent of our roads will be free of work to help Easter road trips go smoothly. "By suspending or completing roadworks, more lanes will be open and many of the associated speed restrictions will be lifted." Ms Clarke added that some of the UK's busiest carriageways will benefit from this hiatus on ongoing transport network improvements and maintenance in the coming days, including the M25, M6, M40, M62 and M20. Work is scheduled to resume on projects from midnight on March 29th.